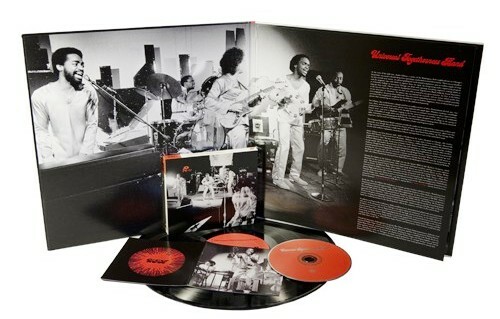 Anyone who questions the value of higher education has clearly never heard the story of the Universal Togetherness Band, a funk/soul/R&B combo whose body of work would be lost to the ages if Chicago’s Columbia College had never offered courses in audio engineering. Andre Gibson, the leader of the Universal Togetherness Band, was attending Columbia in the late ’70s when he heard that an audio production class needed bands for students to record in their studios; he volunteered his band’s services, and as a consequence the UTB recorded many hours of original material between 1979 and 1982 without having to fork over a dime in studio fees. Despite some passing interest from Mercury Records, the Universal Togetherness Band never landed a record deal or released any material during their lifetime, but the archivists at the Numero Group have finally made it possible for us to hear highlights from their Columbia College sessions on a collection simply titled Universal Togetherness Band. Andre Gibson, Chicago native and frontman for the Universal Togetherness Band, was a literal student of music in the late ’70s and early ’80s when the Universal Togetherness Band recorded. He was mired in a musical dissertation with no deadline. But when the audio engineering program at Columbia College went looking for acts students could record in the studio, Gibson and his band jumped at the chance. From 1979-1982, the band recorded – for free, with students using the experience to learn basic engineering skills – a huge mass of Gibson’s compositions. 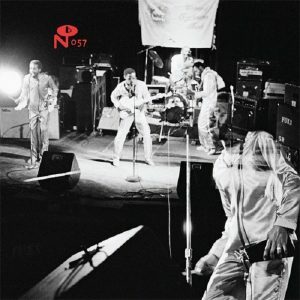 Numero Group’s Universal Togetherness Band compiles a tight cross-section of those recordings, showing the bands tight chops and expansive taste. The band is most often identified as disco-funk, and there’s some accuracy to it when you hear the taut thump of “Real Thrill” and especially the more spare percussive danceability of “Ain’t Gonna Cry“. But both songs show an appreciation for organic sounds. Where the most garish disco sanded its instruments down to soft sounds, “Real Thrill” lets the guitar maintain some bite, and “Ain’t Gonna Cry” shifts into a psych-rock breakdown with a brilliant call and response from the guitar and piano. The band is clearly interested in getting you to shake your hips with these songs, but there’s also something bittersweet in the wordless refrains of “Ain’t Gonna Cry“, and brash defiance in the playful braggadocio of “Real Thrill“. More than contrasting dance grooves with more complicated emotions, though, the band also knocks genres together to see what kind of crash they’ll make. The genre shifting continues over the course of these eight tracks. “My Sentiment” sounds, at first, like straight ahead soul pop. It bounces along on basic piano chords and lean percussion. It also provides us with Gibson’s most nuanced and tuneful singing, and the vocal harmonies the group adds only elevate the melodies. But there’s also keys and horns that push at the constraints of structure, suggesting something closer to fusion than pop music. “Once In A Lifetime” is not a Talking Heads cover, but it plays with rhythms the way David Byrne‘s band did, and the song’s deeply funk groove takes a backwards route through musical traditions, circling through Afrobeat before coming back to James Brown. The influence of Afrobeat subtly works its way through the entire collection. Sure, “Call For Love” sounds more like Mayfield or Gaye, and “Try Try Try” feels almost too spacey to classify, but there’s an approach that unites these disparate sounds. The songs are deeply rooted in hooks and melodies, but like Afrobeat, the overall effect is not one of catchiness but rather repetition. Choruses become endlessly repeatable mantras as these songs stretch out. Verses that help shape the songs get left behind quite often. The band seems to be keenly aware of pop sensibilities, and is constructing songs to get stuck in your head, but Gibson — like his endless dissertation — seems to want to stretch these songs past their logical end, past a breaking point and into a whole new realm. The results, at their best, are transfixing. Even if these songs were created in school, there’s nothing academic about them in practice. The songs here are energetic and energizing, and the production impressive considering where and how the tunes were recorded. There’s also a feeling, though, that this collection is just getting started. The songs represent the best the Universal Togetherness Band can offer, but the eight songs also feel like an entryway to a world music fans can and should get lost in. In that way, the album succeeds while also denying you what you want. The set feels too short, though you can appreciate wanting to leave us wanting, perhaps to open the door for future releases. So Universal Togetherness Band is a strong introduction, though it could stand to let us get a bit more familiar, a bit more entangled, with such a formidable group. What a story..Looking forward to listen to it. Thanks Nikos. I know the video to that last track is a bit corny in retrospect however it is incredibly innovated with a budget in mind in a era before cell cams or even home video cam. Probably using more school resources which tickles the funk out of me, I’ve work AV for colleges for 20 years and most to all the equipment is under used, great to see someone did something with their stuff! The song is catchy as funk! Should of been the hit of the summer it came out in! It will be on my summer play list in about 20mins for the 2019 and beyond. Thank you for introducing me this wonderful group. Really impressed. Can’t download these albuns from easybytes links. Yes. Easy Bytes not work for me (in Brazil) either. Tryed more than one internet provider. “no response” at all. It seems that Easybytez even exhists. I don’t know what more can iI try. thanks for all the work here to publish all that good music. definitely one of the best blogs ever. I’m very sorry I can’t keep downloading and listening. When you had to have talent!! !﻿ Those were the years!!!! it seems EasyBytez do not work In Brazil like Uploaded didn’t work in Italy. But this is what I can offer at the moment. This is sublime and what an interesting background for this recording,mucho thanks!! Wow, this is a real great one. Music like this still live on forever﻿. Great find guys. Couple of things. I had issues too on downloading this one and the Don Verner one. However was able to download all the others I needed including the Johnnie Taylor one. Which was posted after this. I ended up downloading it from another computer and it worked. The other thing I am wondering is how much material did this group have? The single for More Than Enough is shorter than the video version. The video has like a extended mix on it. This group fascinates me, I wonder if there is a cache of there stuff out there? I miss those days when you heard real singing. i am also speechles with the group. Big hugs for posting it. You made my Sunday evening.